GladRags, which makes the MoonCup US, is one of the oldest makers of menstrual cups. Their Keeper menstrual cup, made of latex, has been manufactured since 1987. 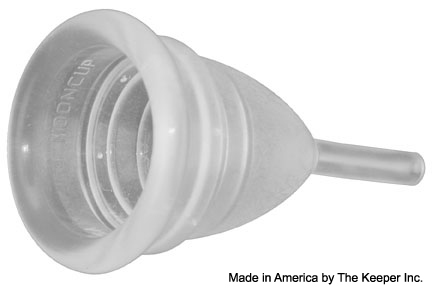 The MoonCup is their silicone menstrual cup. It is identical in shape and size to the Keeper with two ridges around the top of the cup and a smooth hollow stem for removal. It comes in two sizes and you should select the best size for you based on your age, whether you've given birth, and how fit you are. The GladRags company is dedicated to making reusable products for your period. In addition to two menstrual cups, they also make a variety of reusable pads and other accessories for your period.